There was a group of overgrown rose bushes and wild raspberries along the back of the fence that I was dreading working because who wants to deal with thorns? I won yesterday and they are almost all gone. However, even though I wore gloves, some of the giant, old, gnarly, thorns poked through and I have quite a few sore spots on my hands. Rest assured I will not be planted anything with thorns as a replacement. Also, having to stuff them in bags is an extra pain and makes me feel like such a city kid. I miss the big open space in Ohio where we could easy just burn things. It would be some much faster to throw them on a pile and burn them up. However, #neighbors. At least the township passes out the bags free, when we lived in town they charged a pretty penny for yard waste bags. With all our overgrowth, we would be eating ramen noodles to pay for hauling away the bushes. 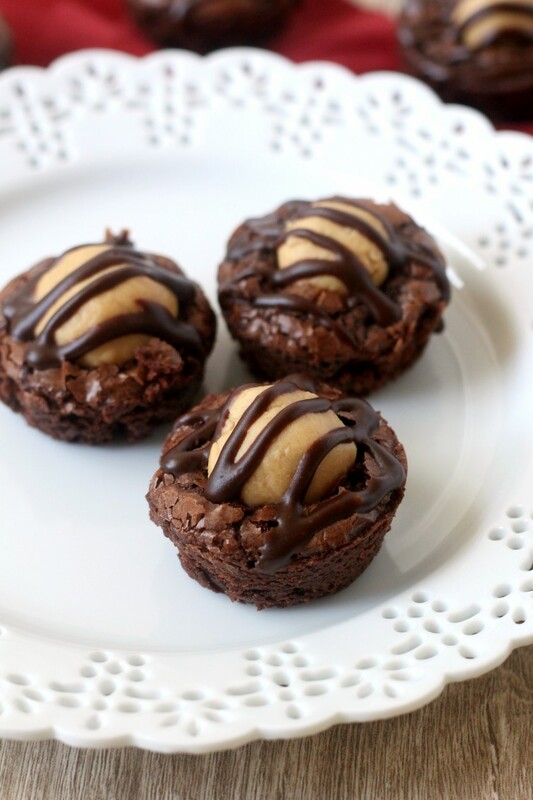 I guess I was also subconsciously missing Ohio in other ways because I made these Buckeye Brownie Bites to satisfy a sweet craving. 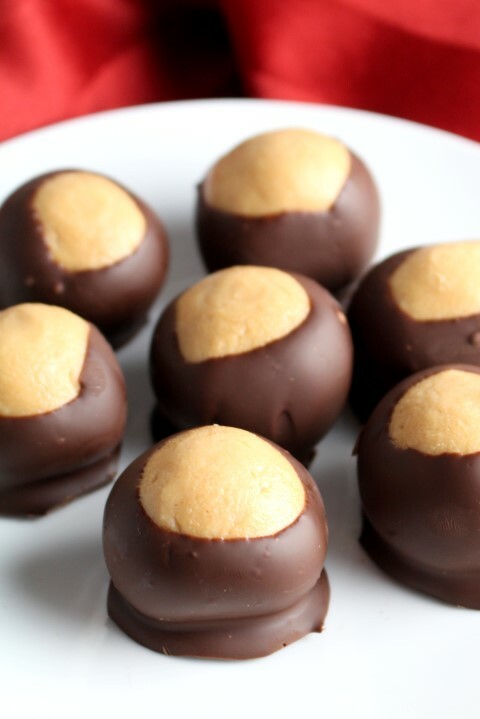 For all of you non Ohio natives, a buckeye is a poisonous nut from the buckeye tree and buckeye candies are peanut butter balls dipped in chocolate to resemble the nut. 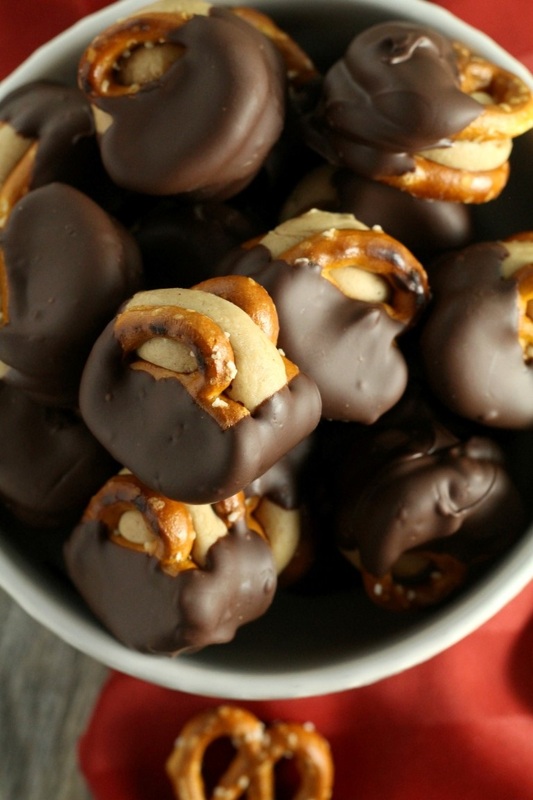 My traditional buckeye candy recipe is one of the most popular recipes on my site and one of my favorites too. Here is a new twist for your to try. 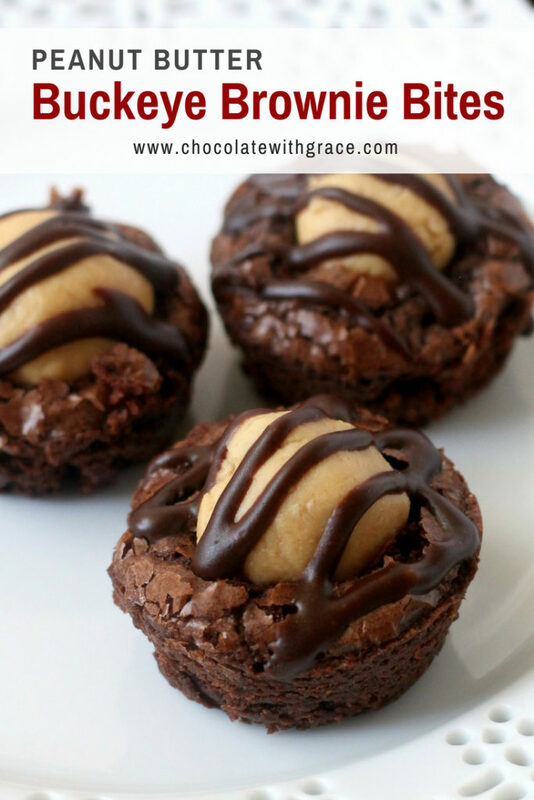 Bake a batch of brownies in mini muffin tins and then press a peanut butter ball on top, drizzle with chocolate and you have a fun chocolate peanut butter treat. It’s less time commitment than dipping regular buckeyes too. Bake for 15-20 minutes or until an inserted toothpick comes out with a few crumbs. 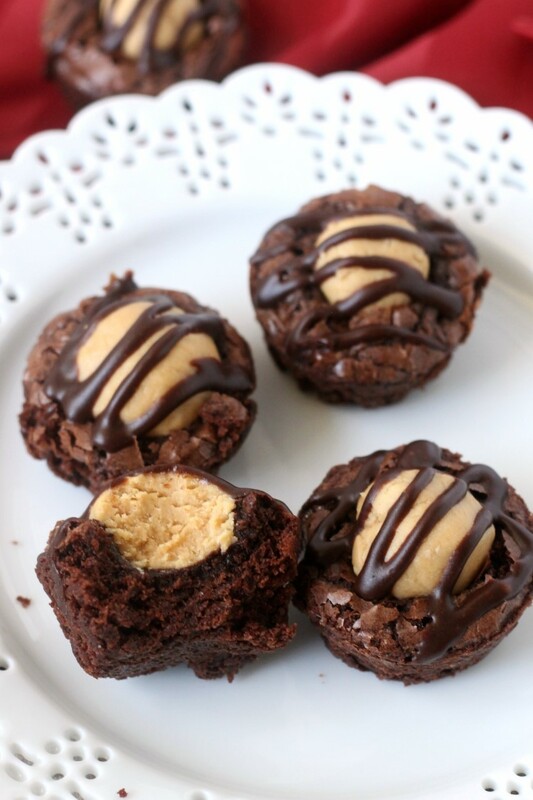 Remove from the oven and immediately press a peanut butter ball into each bite. Let cool several minutes in the pan before moving to a wire rack to cool completely. To make the chocolate drizzle, add the melted butter, cocoa powder, corn syrup powdered sugar and milk or cream to a microwave safe bowl. Stir together and microwave for about 20 seconds. Stir again. Drizzle warm glaze over cooled brownie bites. Glaze will set when cooled. 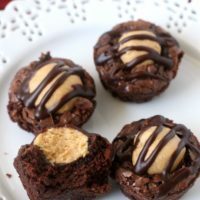 Here are some other brownie bite recipes that sound delicious! And if you’re looking for other buckeye recipes, I have you covered. This is easily my favorite flavor combination. Yum!! Wow do these look so good. I’m almost afraid to make them since I’m pretty sure my family and I would eat all of them in 1 day! I never thought to put buck eyes ON brownies. Now this is the only way I want to eat brownies! Giving this all the heart eyes!! 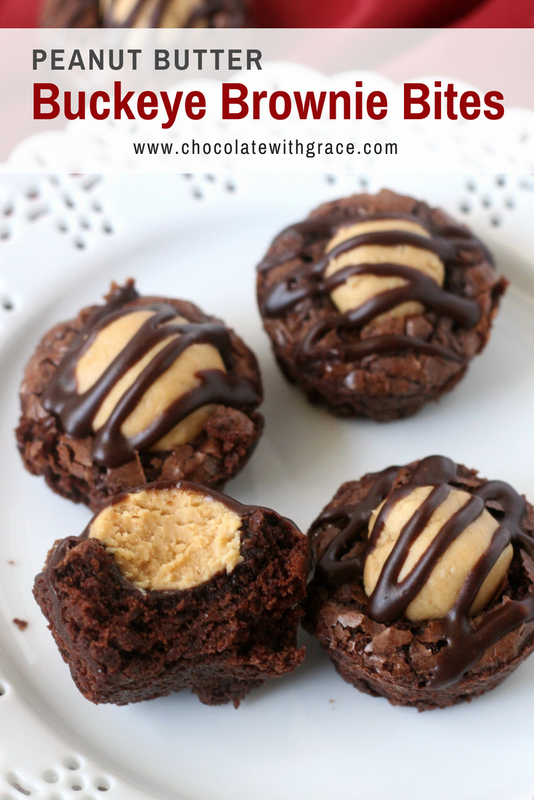 Love chocolate and peanut butter! Yum!! These HAVE to be delicious! I can’t wait to try them! Holy cow do these look amazing. How perfect. I don’t think that these would last long here. These are so delicious – always gone in seconds! Love this recipe so much. How long can I store these? Would they freeze ok? Or in the fridge in an airtight container? They would freeze well in an airtight container for several weeks. I would avoid the fridge. ok thanks! What kind of peanut butter do you recommend? would natural be ok or do you use the sugared stuff (like JIF and Skippy)? These are fantastic! I made them the other day and tonight I’m making them again as Christmas gifts for family. I’m not even ashamed to say that my boyfriend and I ate the entire first couple of batches in less than one day. My brownie bites cooked up over the tops of the paper cups I used and then collapsed in the middle. I’m a terrible baker so I don’t know what that means. Any ideas? It probably means you overfilled the muffin cups. Also could you have used baking soda instead of baking powder? That could make them overflow too. Wow. U r awesome. Ran across ur blog by accident. I’ll never lose it now. Can’t wait to try !